Take equal quantities of honey, lemon juice, and an egg yolk. Mix them well and apply this mixture over your scalp.Massage for 4-5 minutes. Leave the mixture on your scalp for half an hour then wash off with lukewarm water. Mix 1 tablespoon of olive oil in 1 tablespoon of lemon. If you have short hair mix 1 teaspoon of olive oil and mix with 1 teaspoon of lemon juice. Massage your hair and scalp then cover with wet towel and leave it overnight. Early morning Rinse off with lukewarm water and then wash with normal shampoo. Take 1 tablespoon of sour curd and mix with 1 teaspoon of fresh lemon juice. Apply the mixture on your hair and scalp and massage for 3-5 minutes. Leave the mixture for 20 minutes and then wash your hair with lukewarm water. For best results repeat this thrice par week. Apply aloe Vera gel on the scalp to remove dandruff. Leave on for 15 minutes. Aloe vera is a natural home remedy, which clarifies and repairs damaged skin. It fights against dandruff and help a lot to get rid off dandruff. Blend together 1 tablespoon of lemon juice with 5 tablespoons of coconut oil. Apply to the scalp to get rid of dandruff. Lemon juice is a natural home remedy for dandruff and will clear away flakes from your scalp. Leave this remedy on the scalp for 20 to 30 minutes and then wash with a shampoo. Neem has the antiseptic property, which helps in getting rid of dandruff. Apply neem leaves paste on your scalp to fight dandruff as it is a very effective home remedy. Neem leaves is successful in treating lice, treating dandruff and many other hair and scalp problems. Soak methi seeds in water for overnight and mash these fenugreek seeds in about half cup of warm coconut oil. Apply all over the scalp. Leave it on for two to three hours. 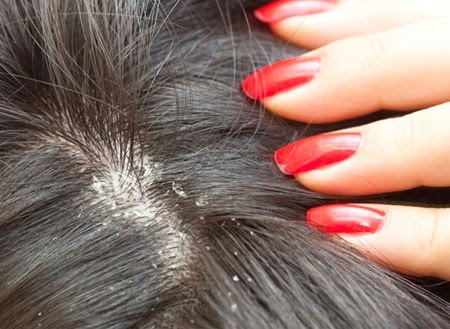 This home remedy will helps to get rid of dandruff naturally at home. Tea tree oil is a natural home remedy for dandruff. Tea tree oil has natural antiseptic and antibiotic properties, which make it best to get rid of dandruff. You can apply tea tree oil directly to the scalp, or add few drops to your regular shampoo. Vinegar is effective in curing itchy dandruff the best. Massaging apple cider vinegar onto your scalp gently increase blood circulation as well as cures dandruff. Apple cider vinegar helps in getting rid of the dead skin which forms the flakes of dandruff and clogs the hair roots. Another easy way of including vinegar in your dandruff treatment routine is to add about a tablespoon of vinegar in your last mug of water as a rinse when you are washing your hair. Take care that this does not get into your eyes. Don’t worry about the smell as it will go away once your hair is dry.